What steps did Castro take to ensure he remain in power? 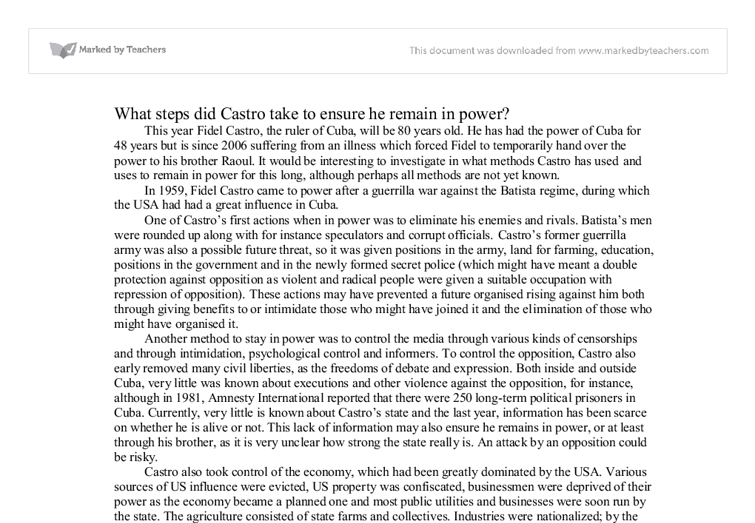 What steps did Castro take to ensure he remain in power? This year Fidel Castro, the ruler of Cuba, will be 80 years old. He has had the power of Cuba for 48 years but is since 2006 suffering from an illness which forced Fidel to temporarily hand over the power to his brother Raoul. It would be interesting to investigate in what methods Castro has used and uses to remain in power for this long, although perhaps all methods are not yet known. In 1959, Fidel Castro came to power after a guerrilla war against the Batista regime, during which the USA had had a great influence in Cuba. One of Castro's first actions when in power was to eliminate his enemies and rivals. Batista's men were rounded up along with for instance speculators and corrupt officials. Castro's former guerrilla army was also a possible future threat, so it was given positions in the army, land for farming, education, positions in the government and in the newly formed secret police (which might have meant a double protection against opposition as violent and radical people were given a suitable occupation with repression of opposition). ...read more. The opposition in Cuba is very shattered and has many internal conflicts so the group is perhaps not a big threat to Castro's regime. Castro has not only managed to keep power through repression and control. Many of his reforms have led to support for him. His First Agrarian Reform in 1959 limited landholdings and forbade foreign land ownership. Other reforms meant that assets were confiscated and redistributed, rents were lowered, there were pay rises, education was improved and made available for everybody, illiteracy was reduced, the supply of clean and piped water was ensured, healthcare improved, controls keeping prices low were made and there were general improvements in transport. The smaller middle and upper classes and the USA did not benefit as much as the masses in Cuba from the reforms which led to clashes with Castro's regime. So inside Cuba things seemed to improve to the masses, who before Castro had been widely neglected. Internationally, it seemed to many that the regime was honest and genuinely seeking the welfare of the people and the avoidance of corruption. The single party system, the economic stagnation and the US boycott of Cuba forced Cuba into a dependence of the USSR. ...read more. Castro has also managed to keep a firm grip of the power by holding the top positions in the state himself and still having somebody to replace him, his brother Raoul. These things have possibly made it more difficult for an opposition against Castro. To gain further support, Castro has the last decade improved the situation for Catholics in Cuba and the international Cuban image by loosing restrictions on Catholics and reinstating Christmas Day, which had been abolished in 1969. Catholicism had for many decades been forbidden and churches had been closed. Abortion was in 1998 condemned by him in response to criticism by the Pope who visited Cuba that year. This may have increased support for Castro both within and outside Cuba and thereby protecting his power. As a conclusion it can be said that Fidel Castro has managed to remain in power mainly due to skilful elimination of enemies and rivals, control of the media, reforms improving the situation to the masses, economic reforms, the exiling of "undesirables", the conflicts with the USA, the alliance with USSR, foreign projects as the aiding of the Angolan opposition, his own image and his reforms improving conditions for Catholics. Sources Jack Watson, Success in World History Since 1945, John Murray, 1997 www.ne.se/jsp/search/printarticle.jsp?i_art_id=148447&i_sect_id=148439 www.ne.se/jsp/search/printarticle.jsp?i_art_id=141950&i_sect_id=141950 www.ne.se/jsp/search/printarticle.jsp?i_art_id=148447&i_sect_id=148467 ?? ?? ?? ?? 1/2 ...read more. This student written piece of work is one of many that can be found in our GCSE International relations 1945-1991 section. Furthermore, local industries faced strong foreign competition with little tariff protection. Investment in industry fell, and capital was transferred abroad. Workers opposed mechanization, so Cuba had less international competitiveness. Besides, in 1958 works programmes were stopped. Therefore, unemployment and underemployment increased. The Cuban Missile Crisis: Was President Kennedy the Saviour of the Cuban Missile Crisis? He had worked this way not make Khrushchev look weak but to give him (Khrushchev) a way out. Kennedy did this because Khrushchev might have acted in an aggresive way. Kennedy had created a situation where both of the leaders would have to back down e.g. 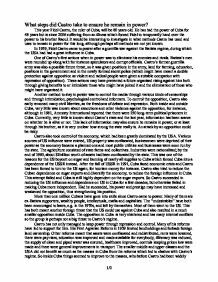 How important was anti Americanism in fermenting the Cuban revolution? Under Castro the government changes things for Cubans. New rules were passed within the first year. Pay increases took place and rent decreased. The main law that made the most significant difference was the Agrarian reform law. 8This law was that no farm could exceed 400 hectares, anything bigger than this would have to go to the state. It now became more likely that if communist Cuba was attached, Russia and then other communist countries in the Warsaw Pact would help it. This made tensions rise between America and the Warsaw Pact countries. Another long term reason why a crisis developed in 1962 about Cuba was because of Fidel Castro's revolution which overthrew Batista. Was Ernesto Guevara Deserved Of His Iconic Status? Cold War Summary, quotes and revision notes. Two superpowers then became intensely involved in the conflict by rushing arms to their client states. E.G. Of CW being fought by proxy. Because of the potential of nuclear conflict between superpowers --> dangerous time for the world. However, were able to use influence to end hostilities. Cold War Short Essays - Questions and Answers. The USSR could no longer keep the Eastern people out of the Western zone. A further key feature was the end of the Brezhnev Doctrine in 1985. Gorbachev stated that the way to rejuvenate socialism was by introducing a degree of liberalism; the armed forces should not be involved. What was the nature of the Apartheid State? This gave the government a reason to arrest him. When in returned in June, he was sent to prison and sentenced to five years of hard labour. Mandela was not surprised. He said, ?I am a Black man in a White man?s court?. The Cold War. What were the reasons for DÃ©tente 1962-1979?